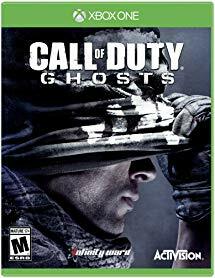 Right now you can get this *BEST PRICE* Call of Duty: Ghosts - Xbox One $17.99 (Retail $29.99). Ten years after a devastating mass event, America's borders and the balance of global power have changed forever. As what's left of the nation's Special Operations forces, a mysterious group known only as "Ghosts" leads the fight back against a newly emerged, technologically-superior global power. A New Call of Duty Universe: For the first time in franchise history, players will take on the underdog role with Call of Duty: Ghosts; outnumbered and outgunned, players must fight to reclaim a fallen nation in an intensely personal narrative. Gamers will get to know an entirely new cast of characters and visit locales in a changed world unlike anything seen in Call of Duty before.